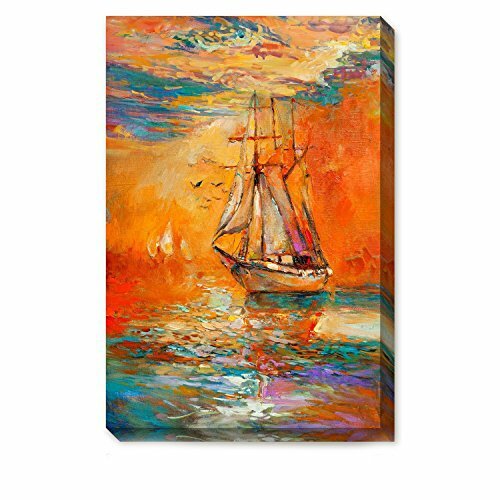 Size: 40x60cm/16x24cm The Sailboat is sailing on the peaceful sea. The golden sunset covers the ocean and boat. And the seagulls are flying around the ship. Everything looks so peaceful and beautiful. It can let you relax after busy work. Bring it to your home. It is also a good artwork to appreciate. Great gift to colleague and friends.Good decoration for wall, home, living room, dining room, bedroom and office. 100% Satisfaction Guaranteed-- can be returned within 30 days of receipt of shipment. ★The Sailboat is sailing on the peaceful sea. The golden sunset covers the ocean and boat. And the seagulls are flying around the ship. Everything looks so peaceful and beautiful. It can let you relax after busy work. Bring it to your home. It is also a good artwork to appreciate. ★Great gift to colleague and friends.Good decoration for wall, home, living room, dining room, bedroom and office. ★100% Satisfaction Guaranteed-- can be returned within 30 days of receipt of shipment. If you have any questions about this product by WallDeco, contact us by completing and submitting the form below. If you are looking for a specif part number, please include it with your message.